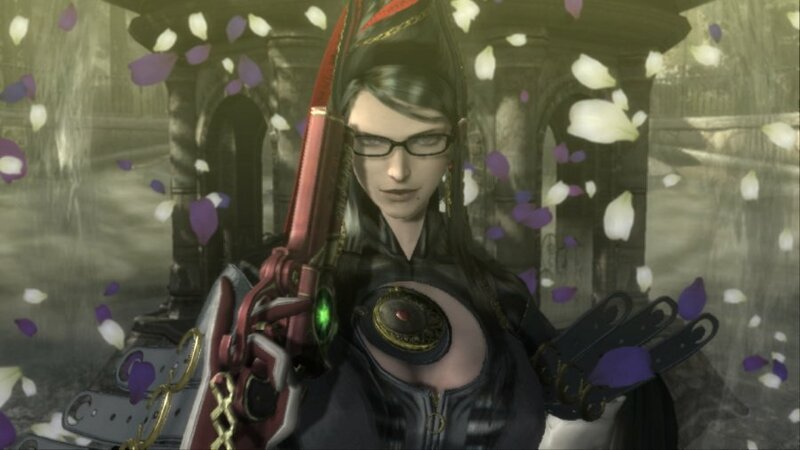 With Bayonetta 3 teased as a Nintendo Switch exclusive, it’s finally time for the sassy Umbra Witch to cartwheel a flurry of bullets onto the hybrid handheld hardware in anticipation. Much like Bayonetta 2, the original instalment in the action-adventure series has been retooled for Switch, and while this isn’t first time the franchise has been ported to Ninty machines (both featured on Wii U in 2014) you’re getting the very best version of the game yet. Yes, technically the PC version runs that bit smoother and looks that bit glossier, but regardless of the specs purring away in your tower, Bayonetta looks, feels and is perfectly suited to Swich’s compact yet versatile platform. The Wii U port was serviceable, but it was prone to some muddy textures and painful amounts of slowdown - a crime for a game as fast-paced and deadly accurate as this. Thankfully, those issues have been resolved and runs so smooth you’d fooled into thinking you were playing it on an Xbox 360, the game's original target platform. Before we get too deep into the changes, let’s break delve into what makes Bayonetta such a timeless classic - and more importantly, why you should be dusting off those giant, angel-slaying pistols on Switch. 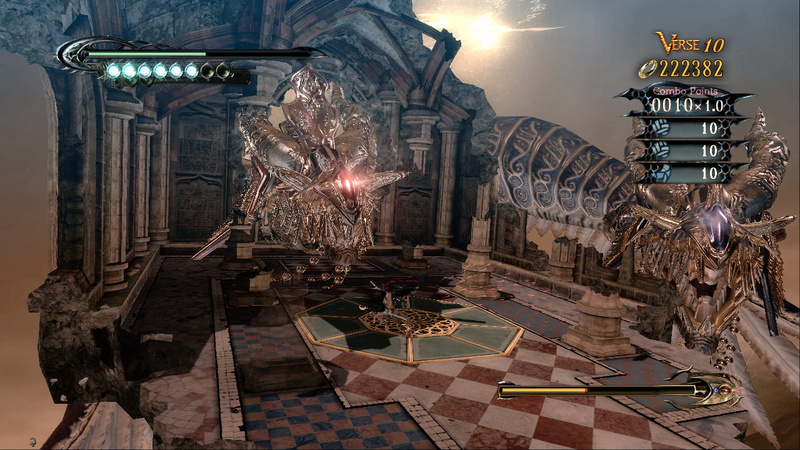 As the spiritual successor to the Devil May Cry series, Bayonetta is an ultra-violent action romp crossed with the world’s most acrobatic, hair-related interpretive dance class. With guns in each hand (and strapped to either high heel) the titular witch uses magic, melee attacks and an endless stream of bullets as she carves a path across the palatial streets of heaven and the blackened caverns of hell. 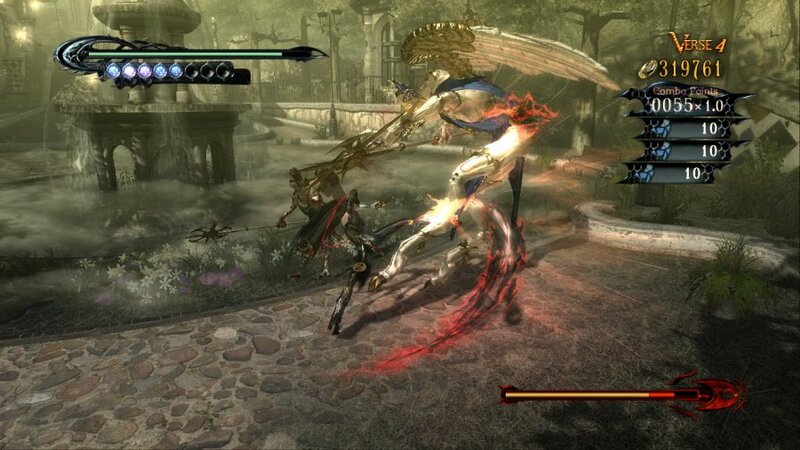 Many see this as developer Platinum Games’ magnus opus - and it’s easy to see why. The sheer depth at hand when it comes to combos is still astounding for a game that originally came out in 2009. With a vast and wonderfully diverse series of enemies and bosses, knowing how to apply these moves and which ones work best strung together turns every battle into a blood-drenched puzzle. You can, of course, dial things down to Easy or Very Easy mode, but the surprisingly challenging Normal difficulty and beyond is where the game’s true heart lies. It’s a challenging game - one that will reap chunks of health from you should you mistime a dodge or commit too heavily to the wrong combo - but it’s a fair one. While the sequel ultimately made that formula that bit more forgiving, that extra bite in the original makes it something truly special. And there are many variances to empower you; timing your dodges perfectly unlocks Witch Time, a brief pocket of slow-mo for unleashing some wicked punishment. You can even transform into a panther and leap across giant chasms, or conjure hellish beasts - made from hair, naturally - and crush, dismember and eat your foes. From its gloriously grand boss fights to a steady flow of game-changing mechanics, it's a game that consistently surprises and effortlessly empowers. It should be said that the titular witch isn’t the most PC of characters, especially in the more self-aware age we live in today. Whether you see her as a strong and confident female character that fights her own battles and takes no BS from anyone (even the giant bosses), or as an over-sexualised caricature more akin to a teenage boy’s ultimate fantasy, she’s still one of the most memorable heroines of the last decade. There are, perhaps, a few too many zooms in on her derriere and the sexual innuendo comes in such a constant flow you’d think you were starring in a Carry On film from the ’60s, but Bayonetta is ultimately a mature game aimed at an adult audience. Then again, the buckets of blood and endless violence might have been the first clue. So, let’s get back to what’s new and different. As we mentioned earlier, the Switch version of Bayonetta runs far smoother than the 2014 Wii U port. With a more powerful GPU and CPU at its disposal you’re treated to a consistent frame rate and minimal screen tearing. The camera is still a little clunky, especially when things get a little heated, but it’s something you simply adapt to the more you play. Quick Time Events, sadly, are still a thing in this version of the game, and they’re just as unfair and utterly redundant as they were in 2009. Thankfully, the Switch version is forgiving with its checkpointing (and impressively swift with its loading times) so while having to retry is frustrating, at least you’re not being doubly punished from a logistical standpoint. The biggest change are the touchscreen controls. 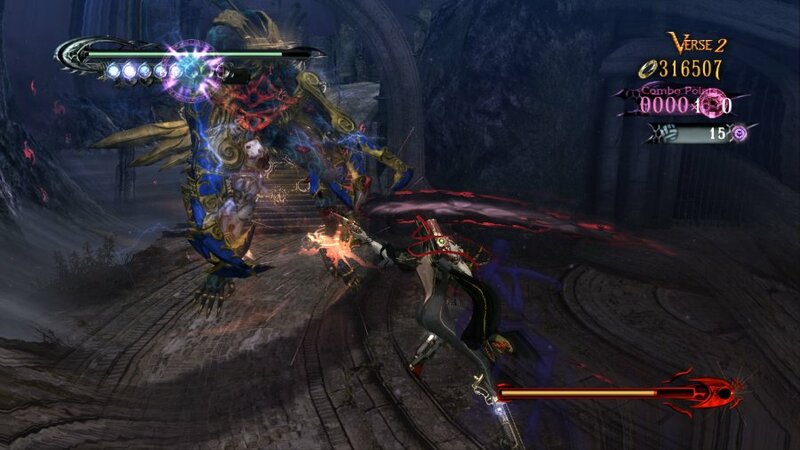 In the Wii U version, the single-touch setup of the GamePad made controlling something as fast-paced as Bayonetta a consistent exercise in frustration. On Switch, this control method has been completely revamped. The system’s capacitive display allows for more precise movements so moving Bayonetta around the screen in handheld mode is breeze, as is swiping back to evade or pressing down on an enemy to automatically attack. More complicated moves don’t translate to the touchscreen so it’s not a full experience, but hats off to the developer for finally nailing the application. The intense action of Bayonetta does make it a little intense to play in handheld mode, at least to begin with. If you’re switching between portability and a traditional TV, the transition can be a little jarring when shrunk down to Switch’s 6.2-inch screen, but if you’re playing longer sessions in handheld the smaller screen real estate eventually becomes the norm. Even the sometimes muddy textures of this ageing classic look a little crisper in this format, despite the assets being almost a decade old. If you're buying Bayonetta 2 on Switch (as we imagine you probably are) then you'll get a copy of Bayonetta for free as a digital download. You can also download it separately, but it'll set you back a good £25 so it's worth investing in the bundle if you want to make your pennies go a little further. I didn't even know this franchise existed until 2 came out on the Wii U and since I skipped that system I can't wait to finally play these. Hideki Kamiya's about to make you his witch. ...Sorry. Game is easily a 9 though. Never got around to playing this on Wii U, the technical improvements are food for thought... but it still seems silly to re-buy something I already own. Same price as the Wii U version, added nothing and is only available as a download code in Europe and the US. The Bayo2 review has similar issues. I don't want to be harsh, I love this site, but I wouldn't expect this from NL. Already have 1+2 pre-downloaded; always wanted to get around to playing these but have never had more of a confirmation than now. It is time!!!!!! Isn't the price exactly 60€ if you buy it in store or download them both digitally? 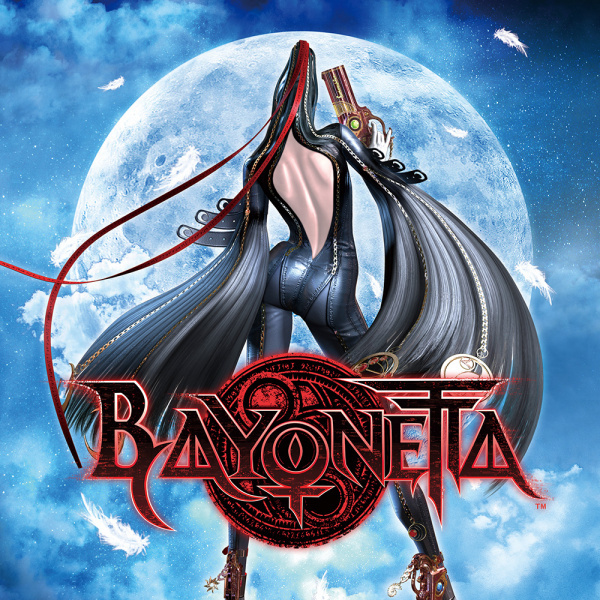 Looking forward to having Bayonetta on the go. Very much enjoy this game. Release falls right on my payday. How do u always know, Nintendo?? To be fair, Carry On Up The Khyber is a classic! Never played Bayonetta or Devil May Cry. Reviewer has me worried I'll need to play on easy to make progress. I'll give normal a whirl first try though. Another public service announcement about the looks of Bayonetta. What is the deal with people having to mention the looks of a character in a video game? The Bayonetta 2 review made mention of it too. Rant done. I owned the Wii U version. What I liked about it was that you got Bayonetta 2 and the first game on disc rather than one physical and one digital download. But I didn't actually finish Bayo 1 or 2 on Wii U simply because the GamePad wasn't that great for this game, it got tiring to hold pulling off all those combos. And as the review says, the frame rate dropped considerably and frequently and the loading times took forever. Glad to see the Switch versions have fixed those issues. I traded in my Wii U discs for credit towards the Switch versions....and I'll just live with a digital copy of the first game. @Mince-Pie Join the dark side. Embrace an all-digital library. I hate it when company refuse to make physical version of a triple A game like c'mon I'm not going to buy the digital version, if it cost more than $20 on the eShop then I'm not buying it period. This is one of the reason why I never bother with Yooka-Laylee and Tiny Metal cause they cost full price when they aren't even physical releases. Digital games need to be $20 or lower otherwise they will not be getting a buy from me, the only way that would benefit me buying them at full price is if they are physical. It would seem Bayonetta 2 would be the only one I pick up. You better off just getting the PC version for $14. Hands down the best version of Bayonetta. Nintendo reviewers are so cringe worthy considering they say everything no matter what is "perfectly suited to the Switch". Bayonetta being "sexualized" is a part of the package. Everything about these games is over the top. The violence is extreme, the action is extreme, the attacks and abilities are extreme, the story, the world, the battle settings are all crazy, the sexual innuendo just simply falls in line with that. @Menchi187 spoiler alert: it is. And did you really use the word cringeworthy over a review? @Agramonte Nah. I'll happily pay $6 more for a portable version (that can also go to my tv), that seems to be second best. I bought this for 360 and yeah it was good not the genre defining experience some people make out but good. Played it again on WiiU just for the novelty of something to play but can't justify a third run not when I could just play it on WiiU. Will say this for the series some of the enemy and environment design is incredible. @PhilKenSebben na... the PC is amazing. I played it at [email protected] and it looks great. Getting this is like eating a baloney sandwich at home for dinner because you can also eat that on the bus to work. Why limit the experience. Bayonetta 2 and 3 is a different story - you have no better option. @SLIGEACH_EIRE and what’s your point exactly? Improved performance isn’t “added nothing” in my book. Unfortunately ports are still considered as new software for the purposes of pricing, so there’s nothing to be done here. Anyway, buying Bayonetta 2 and getting a code to download the first for free isn’t a bad deal at all and much better than what we get in Japan, since here you don’t get Bayonetta for free when you get Bayonetta 2. They’re both separated purchases. And you can’t get the physical version unless you buy the special edition, which is a limited edition sold out in many places already. @maruse Improved performance is down to better hardware not because of any work they've done. You don't know what you're talking about. You dont get "a code to download the first for free " when you buy Bayonetta 2. You get a discount, just like on Wii U. "You dont get "a code to download the first for free " when you buy Bayonetta 2. You get a discount, just like on Wii U." Really? You're right, that actually I didn't know. Why did I though that the code was for Bayonetta? Sorry for the misunderstanding. Anyway, my point is still valid. Better performance is not only because of better hardware since the original code must be optimized to the new hardware, so there is indeed some effort that needs to be put into porting the game. I'm sorry but you sound like you're complaining just for the sake of it. That you do, doesn't mean that the rest of the world have a Wii U or have played those games before. If you already own those games, then by all means just ignore them. What's wrong with the rest of us getting a chance at playing them? Bought 2, but am starting with 1. Never player either but always heard good things about them. @ACK Nice.... but no Superfly lol..
@retro_player_22 I always try to purchase a physical copy where possible and it is incredibly disappointing when companies don’t release one (Bayonetta, RE Revelations 1+2, Yooka Laylee). However, there is a reason why Digital titles will never be cheaper than their physical counterparts, despite the cost savings from not having to do a manufacturing run. The reason? It will put retailers out of business. Most retailers are already struggling as consoles slowly shift to a digital era, much like the PC did with Steam so having cheaper than retail prices would likely have a severe impact. Nothing beats a physial copy in my opinion but there are those who simply go where the price/convenience is. Strongly disagree with the review ,this game is excellent and better than a 8 out of 10 . Both are completely fantastic titles and Nintendo made a very wise decision when getting this series as a Nintendo exclusive now, Im ecstatic that 3 is on the way. I played the Wii U demo and wasn't too fussed. Will probably give this a miss. Self-aware age? Lol yeah right. You're confusing outrage culture for self-awareness. They're almost the exact opposite. Outrage culture is about being hyper-aware of other people, not yourself. @Oat Thanks, I hadn't thought of that. Although I believe he's fixed the errors here now so I'm sure the @nintendolife staff read the comments anyway. @SLIGEACH_EIRE @maruse If you buy Bayonetta 2 on cartridge (in Europe and NA) you absolutely do get a code to download Bayonetta. @AcridSkull Yes but you've paid for it in the cost of the game. @SLIGEACH_EIRE that's completely objective and beside the point. @AcridSkull That's when you buy digitally. However, when you buy physically, Bayonetta 2 has the cost of Bayonetta factored into its price. @SLIGEACH_EIRE at no point did you or @maruse mention buying digitally, as such your sweeping statement was, and still is, incorrect. @AcridSkull I'm done talking to you with your nonsense. Will import the Japanese physical release as soon as it becomes available (which includes most languages on cart). @SLIGEACH_EIRE It seems I wasn’t wrong about the download code after all. And it wasn’t I the one who “don’t know what you’re talking about”, but anyway, whatever. I’m not here to argue with you or make you change your opinion but your complaints here don’t make sense in the least. @maruse Sorry but you were wrong. Repeating myself here but you dont get "a code to download the first for free " when you buy Bayonetta 2 either physically or digitally. O.K, I'll entertain it, tell me how it's free? If my understanding is correct, you get to download the first game for free if you buy the second on cart, or a discount if you buy it digitally. Am I wrong? @maruse OMG! How can you not understand this? It's not free, Nintendo have factored the cost of Bayonetta into the price of the physical copy of Bayonetta 2. Look at my comment #46. I can't believe I'm having this futile discussion. I'm done. Like you said, we’re done, there’s no point prolonging this. Thank you, somebody who gets it. I'm starting to tire of the virtue signaling to be honest. Same happened in the review for Bayonetta 2. I think it has to be mentioned about the sexualized nature of the character because there may be a parent reading the review thinking of getting the game for a young kid. In that case it helps to know. There also could be somebody who's sensitive to that kind of stuff so again, it's good for them to know also. But the level I've seen a lot of journalists take this crap to is beyond annoying. @maruse there's nothing wrong with your English reading skills, you're 100% correct. @Gamer83: Man, I have been tired of virtue signaling since it even became a thing. The people that virtue signal appear to be covering for something. Oh and LOL at a review for Bayonetta in 2018. Is Nintendo going to bring out this game every generation? @Ryno Bayonetta has seen two generations. Come back when it's an actual trend lol, 'every generation' is meaningless when it's only twice. It was a game released and updated at least a little, and it's never run portably before. It's all fair game for a review. Seriously, some of the biggest jerks are the ones who are loudest about others being sexist or whatever for daring to enjoy a game like GTA and partaking in some of the less savory side activities. Well, i wasn't going to get either of these, and now I have both and everything else in my collection has officially become BACKLOG lol. This game is bananas, and I just hope I can wait and finish #1 before i dive into #2! I was saving the last of these eShop funds for some upcoming indies but I decided to give Bayonetta a shot and holy crap...so glad I did. Just STUPID fun and such a fluid experience, and not a bad deal getting both for $60. Can't wait to play more!!!! @SLIGEACH_EIRE That's where Amazon Prime comes in. $47 for both games is a really good deal. I know it's a little bit of tom foolery, but if you're really really strapped for cash and want to get it for even cheaper, you could do what I did; use the Bayonetta 1 download code, buy the digitally discounted version of Bayonetta 2 for $30 and then sell the physical copy of it for $40. At that point you get both games for $37.